Tutorial – Adafruit AGC Electret Microphone Amplifier – MAX9814 « Adafruit Industries – Makers, hackers, artists, designers and engineers! 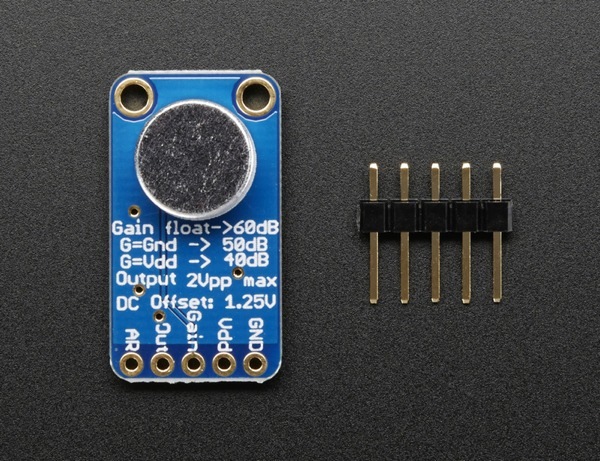 Tutorial – Adafruit AGC Electret Microphone Amplifier – MAX9814. This fancy microphone amplifier module is a step above the rest, with built in automatic gain control. The AGC in the amplifier means that nearby ‘loud’ sounds will be quieted so they don’t overwhelm & ‘clip’ the amplifier, and even quiet, far-away sounds will be amplified. This amplifier is great for when you want to record or detect audio in a setting where levels change and you don’t want to have to tweak the amplifier gain all the time. The chip at the heart of this amp is the MAX9814, and has a few options you can configure with the breakout. The default ‘max gain’ is 60dB, but can be set to 40dB or 50dB by jumpering the Gain pin to VCC or ground. You can also change the Attack/Release ratio, from the default 1:4000 to 1:2000 or 1:500. The ouput from the amp is about 2Vpp max on a 1.25V DC bias, so it can be easily used with any Analog/Digital converter that is up to 3.3V input. If you want to pipe it into a Line Input, just use a 1uF blocking capacitor in series. Each order comes with one assembled and tested board, with electret mic pre-soldered on, and a small piece of header.